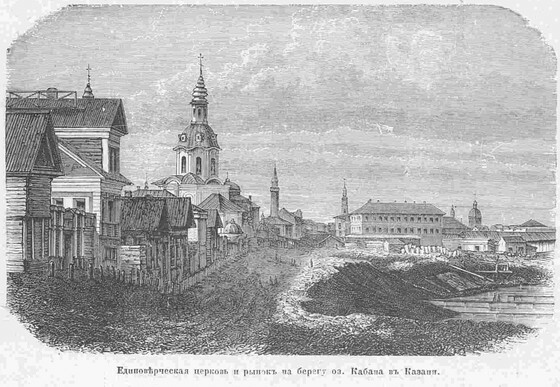 "A old-ritualist church and market on the shore of Lake Kaban in Kazan": A view of the southern shore of Lake Kaban which highlights Kazan's religious diversity. In the background are Orthodox cathedrals. In the middle distance the Haymarket mosque is clearly visible. And toward the foreground is the Four Evangelists church, run under Russian Orthodox auspices but for use by members of Kazan's "old ritualists" sects, who dissented from various official church practices. “Edinovercheskaia tserkov i rynok na beregu oz. Kabana v Kazani,” Kazan 19th c. - Urban explorations of a nineteenth century Russian provincial capital, accessed April 21, 2019, https://kazan19c.com/items/show/34.